The black Suunto Core Classic Watch features all the tools you need for your next outdoor adventure. The Core Classic comes equipped with an altimeter, barometer, and compass. It provides detailed weather information, including current temperature, weather trend indicator, storm alerts, sunrise/sunset, and more. The Core Classic is also built tough, with a rugged aluminum bezel and durable silicone strap. It's water resistant up to 98', so it can survive even the harshest conditions. Box Dimensions (LxWxH) 5.0 x 3.6 x 3.6"
Core Classic Outdoor Watch (Black) is rated 3.3 out of 5 by 3. Rated 5 out of 5 by Michael from Great Watch I brought it because my casio pathfinder watch has a smaller screen and thicker thin this watch. Overall this is a great looking watch with nice features. My casio watch you could see the sensors around the face of the watch, and with the suunto core it doesnt show any sensors. Rated 4 out of 5 by Robert from Display too dim I like this watch, however, the display is too dim (with or without the back-light), but is usable. Functionally, the watch works great. 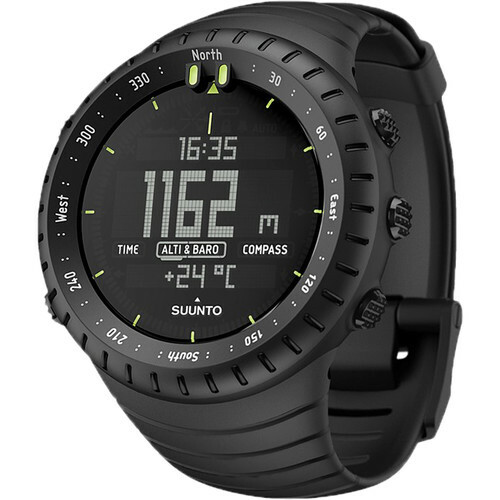 Are you an authorized suunto dealer? Yes, we are an authorized SUUNTO dealer. how do you set it so that the year and day of the week match??? 6.1. Changing time settings: You change the time settings in MENU. To enter time settings in MENU: 1. Enter MENU by keeping [Mode] pressed down. 2. Scroll down to TIME-DATE using [- Light] . 3. Enter with [Mode] . 6.1.1. Setting time In TIME you set the time. To set the time: 1. In TIME-DATE, select TIME. 2. Change the hour, minute and second values with [+] and [- Light] . 6.1.2. Setting date In DATE you set the month, day and year. To set the date: 1. In TIME-DATE, select DATE. 2. Change the year, month and day values with [+] and [- Light] . To change the format in which the time is displayed, see 5.1. Changing units. Suunto Core 11 6.1.3. Setting dual time In DUAL TIME you can set the time for a location in a di‚erent time zone. To set dual time: 1. In TIME-DATE, select DUAL TIME. 2. Change the hour, minute and second values with [+] and [- Light] . NOTE: We recommend that you set the current time at your current location as the main time because the alarm clock emits alarms according to the main time. You are traveling abroad and you set the dual time to be the time at home. The main time is the time at your current location. Now you always know the local time and you can quickly check what time it is at home. Can it track multi sport activity? It could be, the display is a bit big but other than that anyone could use it. Will all the features work in remote areas with no cellular service? Can the watch face be read in the dark? Is there a light or are the number luminescent? thanks. How accurate is the altimeter? It's not that easy but if you find a good jeweler (and there is a watch and jewelry) in the mall close that I used. Most of the core watches are it replaceable, so if you call they'll probably say not, but ones that looks will or can replace it.